Pirate Isle online slot is a new pirate-themed game from RealTime Gaming (RTG). The game is available in Android devices. Unlike other games from this developer, the new online slot machine features 3D graphics and comes with an extra bet option. This article provides a review of some interesting features that make this new offering from RTG a cut above the rest. 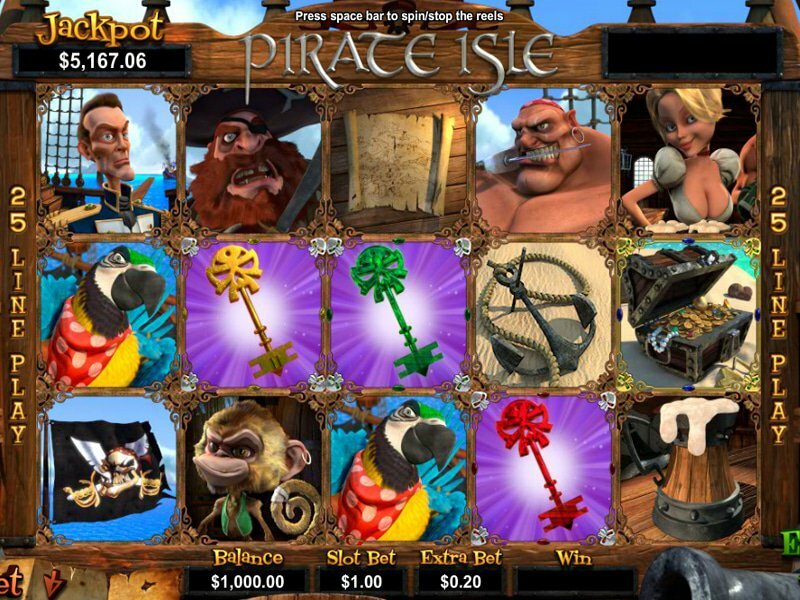 Pirate Isle online slot has 5 reels and 25 paylines. It has amazing symbols. The captain (Jolly Rogers) is a top paying symbol, along with the wench. A player starts winning when he gets just 2 of either symbol. The victim and the pirate symbols are next in rank. These are followed by the anchor, monkey and parrot, map and ale mug, cannon, and ship's wheel. In addition to the symbols mentioned, a player will also encounter a number of important keys during a game. A skeleton key is a wild symbol which can replace any symbol except the bonus and scatter symbols. Making it part of a winning line doubles the winnings. Other keys like Ruby, Emerald, Gold, Sapphire and Diamond form a winning combination with at least 2 of the same kind. The scatter symbols are represented by a galleon and a treasure chest. The latter can trigger the bonus feature which gives as many as 300 free spins. In addition, the free spins has multipliers and that means better chances of getting much higher payouts. Hitting at least 3 treasure chests reveals the map of Pirate Isle where a player can choose 1 out of 5 locations. On the other hand, having 3 galleon scatter symbols on the reels trigger the Broadside bonus round which is part of the Extra Bet Broadside feature discussed below. Pirate Isle online slot has Extra Bet Broadside, a special feature which can be activated by betting a few additional coins for each spin. A player must fight and defeat as many enemy galleons and treasure ships. He gets to move up a prize ladder as he defeats more enemies. Ultimately, the bonuses will lead to a progressive jackpot. The feature ends when a player loses in a battle. This game has an autoplay option which is simple to use. It is preset to 1,000 spins with the option of turning some of them into turbo spins. Standard features present in other RTG-developed slots are also available here.